We played the scenario twice on Sunday, the first was Mark and Frank vs. Kevin and the 2nd was Kevin vs. Bill. Kevin never got to sip the nectar of victory! Bill remarked the scenario seemed balanced as both games were close and there was one victory apiece (an alternative theory is that the losing sides had a single unifying factor: being led by Kevin). Though a think credit must be given to Frank, Mark and Bill who executed brilliant plans, steady and well fought. Unfortunately I forgot my camera at home, so only two poor pictures from my phone! Frank and Mark led the UN force. The second French Groupe de Combat was setup along the river bank. The sniper team and the forward observer setup in an over watch position to the North East. The GPMG setup in the central compound with the two VABs in the road to the east of the central compound. The two fireteams in the eastern compound found the two dead UN workers. One of the fireteams exited the compound and headed to the NE to secure that flank [and neutralize the hotspot], the second fire team climbed on the roof of one of the buildings in the compound to support the flank protection team. The Groupe de Combat on the river advanced toward the building to the central north with the plan to secure the north flank [and neutralize the hotspot]. The first action begun on the road, the insurgents attempted to ambush the VABs as they drove eastward, the insurgents failed to hit the VAB with their RPG, and return fire from a VAB and the GPMG killed an insurgent. The VAB then drove into one of the drainage ditches and bogged. The 2nd VAB came to a halt behind the bogged vehicle. A team of insurgents hiding in the northern building peered through the upper windows, and spotted the approaching French. They decided to wait until the French were closer and more exposed. The French, however, had spotted them, but assumed them to be civilians. The snipers on the hill, however, managed to spot weapons, and the FOO called in artillery. A 105mm shell smashed into the roof, collapsing most of the internal floors. Meanwhile, the 2nd VAB navigated around the bogged VAB and then bogged itself in the same drainage ditch. The insurgents in the west advanced on the stricken VABs. In the exchange between the VAB, the GPMG and the three surviving insurgents the GPMG was hit hard. Meanwhile the French on the north flank moved to secure the flank. The 2nd VAB self-recovered and proceeded to the eastern compound. 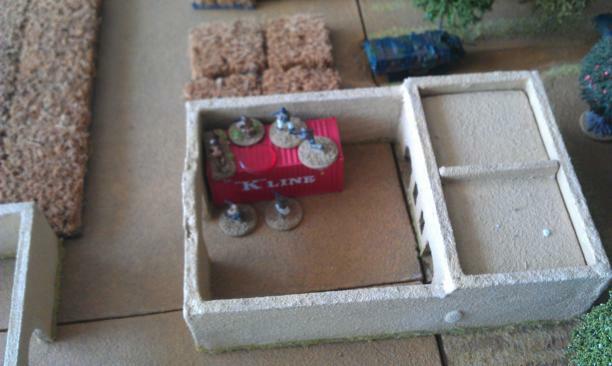 The snipers spotted an insurgent PKM sneaking up on the eastern compound, but a well-aimed shot put an end to any further movement. A group of insurgents in the orchard attempted to ambush the VABs, but came off worse, falling to the heavy machine gun fire, a mortar barrage and the attention of the sniper team. A group of insurgents crept up on the central compound and stormed it, they found the GPMG team knocked out, they attempted to medicate and capture the two wounded gunners, but bungled the first aid, both gunners died in their care. The 2nd VAB had now driven across the river to the eastern compound. The fireteam in the compound retrieved the bodies and the 2nd groupe moved into to secure the VAB, they immediately came under fire from the south, but the combined sniper, infantry and VAB fired caused the insurgent attack to wither before it could successfully engage the enemy. The 81mm mortars added to the fire. Overview showing the two bogged VABs, the downed insurgents in the orchard and the end of the GPMG team. The insurgents to the west now tried to attack the VAB again, but under fire from the northern groupe de combat, combined with the VAB dropped all three attacking insurgents. In the central compound the insurgents climbed an old shipping container to bring fire to bear on the withdrawing French. The VAB carrying the eastern groupe de combat and the two dead UN workers crossed the bridge and headed westward. Finally the insurgents started to pour into the area, a large concentration of insurgents appeared from the south, but the sniper and forward observer soon put an end to any insurgent intentions of interfering with the withdrawing VAB. 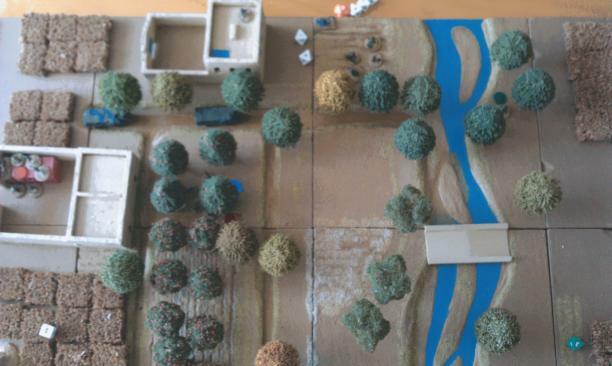 The French attacked the insurgents in the central compound killing three, one plucky insurgent with an RPG survived numerous attempts to kill him, but the French fire made it impossible to bring his RPG to bear on a target. He was eventually knocked out. The French continued their withdrawal under the protection of the FOBs artillery. The French came across three wounded insurgents in the road and captured them, they gave them basic battlefield first aid, one lightly wounded insurgent supplied useful intelligence before being bundled off to the MANA in Azmakassar. The third seriously wounded insurgent died during his evacuation. Before withdrawing a Chinook arrived with a SASR team from Australia, the team secured the central compound and found the two dead GPMG gunners, they retrieved their bodies and their equipment. Major Zaster was pleased with the outcome of the operation, even though they had suffered two dead. He had had a bad dream about the operation being a disaster, and was happy to see the French return with prisoners, the two UN bodies and had not suffered a single casualty themselves, except for one lightly wounded soldier. Lessons learnt: Regular insurgents are nasty! Beware LOS under trees! And most important, if you intend to load a vehicle ensure its doors are facing where you need it to be, I forgot to turn around my VAB and ended up spending an extra critical turn loading, having been slowed down by the insurgents this turned from a mistake to a critical mistake. Numerous trees result in problems for rooftop overwatch and offboard overwatch, obstructing LOS to large areas. In the 2nd game the weakness of the 3-man fireteams of the French was, as usual, evident. And one final lesson, if you ever find yourself being led by me, mutiny!